The International Rugby Board reckons that rugby is experiencing unprecedented growth, interest and popularity. The numbers involve 4.5 million men women and children playing the game in 118 countries. The participation is projected to increase to 6 millon in 205 countries. Japan was the top Asian market ranked fifth worldwide with 122,598 registered players ahead of Sri Lanka (103,325). Asia’s Lanka ranks among the first 10 in numbers. Sri Lanka joined the first five in Asia. Many hope the union stays united and focused and continue the preparation that will help them no end. Next year’s A5Nwill probably be the most competitive ever. Probably UAE will end last this year and Sri Lanka will be the replacement capable of matching the rest. The only obstacle many see and fear is SL rugby politics and the thinking that does not see beyond the nose. 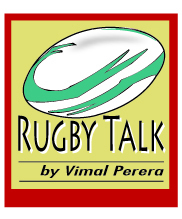 Sri Lanka joining the elite Rugby playing nations of Asia exposes them to countries that have adopted a more professional approach. They join skilled players much fit and speedy, contributing to the faster game. The approach, seen globally, has led to more quality tournaments that are held around the world and more sevens rugby that entertains. Sri Lanka steps to another phase while the quasi professionalism that started in the hills has spread. More clubs with more funds on the table, as of the traditional ones are finding it difficult. The game is moving in another direction with more sevens and more franchise teams. This brings more opportunities and more pressure. Specifically to match officials “referees”. There is a global trend in players and coaches increasing while numbers of referees has seen a real decline. The numbers of players registered are 4.5million while there are 32,972 referees making it 1 referee for 136 players. One reason being that the referees are still part time and the pressure that goes with it is not worthwhile .This is something that some who prefers to go back to the Victorian Era of having referees doing an honorary job has to think as we step into the next level. An article –Professionalism by Dads written over 10 years ago has been used for reference as what was written, has a lesson to Sri Lanka. When there was only Rugby Union the game was played for the enjoyment and camaraderie no-one took money to play; no-one expected it. Some still love and talk of that era whereas it has passed its stage maintaining the ethos and the values as pronounced for over a century and half of rugby. The first talk of payment surfaced over 100 years ago. Dissension crept as some felt a few pennies were needed to offset the time they had taken from work. Clubs began to make payments and were suspended for ruining the spirit of the game. In 1895 twenty clubs voted to break away from the Rugby Football Union and developed into the Rugby Football League. For another hundred years, Rugby Union held out against payments. France was ejected from the Five Nations tournament in the 1930s for alleged payment of players. The game of English Rugby went through a transformation in the eighties moving away from being the sleeping pad of a few well oiled ex-public schoolboys. The parallel you see in Sri Lanka is no different. Successful Rugby World Cups brought the game into homes that before would never have dreamed of watching it; marketing men pushed the spin-offs, and the Unions embraced the concepts because it meant… money while the players remained amateurs. Through modeling or advertising big names started to make a bit of money as long as they didn’t do whatever they were doing in a rugby shirt, or holding a rugby ball. After the 1995 Rugby World Cup the way had to be given for professional rugby. Similar to what happened to cricket media men were offering players what they had dreamed of: a fat wallet. Almost overnight the hundred years of amateurism was over. Clubs found sugar daddies with bottomless wallets, and players with lifelong ties disappeared to the new paymasters. This allowed players to concentrate on their games, improve skills and fitness levels without the strain of having to earn a living simultaneously elsewhere. What would possibly then go wrong? The rugby in England has been overshadowed by the continuing struggle for control of the game at the top level. Players were threatening not to represent their nation opting to play where the money was. On the playing side, all would seem fine, top stars, close games, all the fun of the fair. While the clubs at the top go from strength to strength, those below were beginning to show the strains of trying to compete in a world where success is measured in � signs and not tradition. Undoubtedly, the game at the very top level will continue to grow. But not far below are the clubs that will maybe never return to that top drawer, or may even go under due to lack of funds or even players. This happens in Sri Lanka too. Down the ladder the junior clubs soldier on as they ever did; down there the pressure is as high as ever to compete, and climb the ladder may lead to commercial success. So, what of professionalism then? It’s easy to be negative, and to pick out the problems. Some of those problems may have existed anyway, despite professionalism .Professionalism had to happen anyway; the days of hypocrisy are now over. Learn the lessons and the game in Sri Lanka will go on. The thinking is right and some of the action taken so far is good and we hope for the best. The use of outsourcing for a better job and breathing down on volunteers at the A5N was a right step. The medical unit in attendance was up to the expectations of an international tournament with almost all equipment for player welfare available. The game has to be structured all round and the way around seem good. Other than Japan Sri Lanka is the only Asian Country that will draw over 6000 for a game. So have fun! !